Parts For Sale Any parts that may go with a swap. Engines, balancers, wiring, suspension etc. Hey guys, forgive me if I'm posting this in the wrong place. 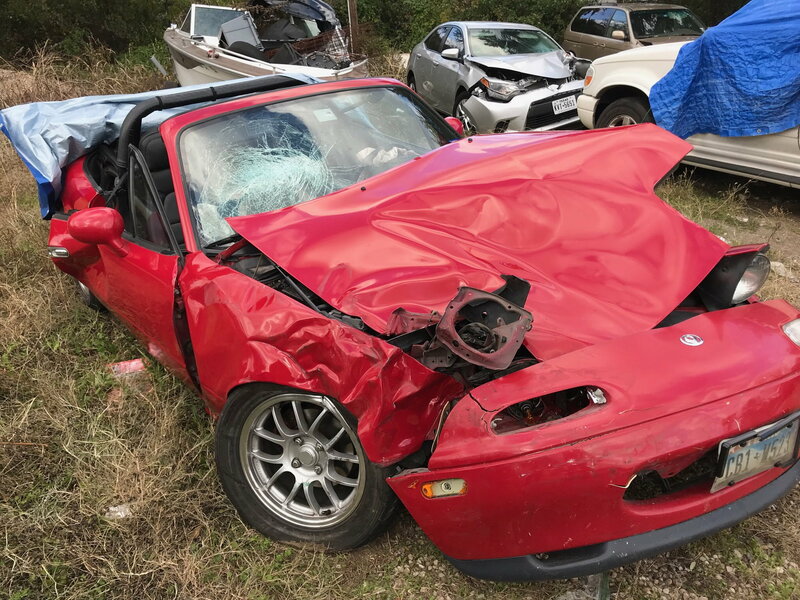 My Miata met the end of road the Saturday as we were on our way to a car show. Suburban ran a red light at speed (this is TX so that meant 60-70 for him), and his drivers side met our right front and spun is down the side of his suburban. live. No weight on my broken legs for 6-8 weeks plus other breaks. Bad concussion and broken bones for my wife. Rehab centers to be our next places to hang out. At some point, depending on what ins co's say, possible parts to sell. We'ii see. Be careful out there. I'm glad I used the safety equipment from the Mustang donor including the fuel impact shut off. We were trapped in the car and thankfully there was no fire. The roll bar might have helped some with the minimal deformation of the passenger compartment; the jaws were used on her door but not mine. I'll still be lurking on here but I don't see another build in our future. Out original plan was to build it and play with it for 5 years then sell it and get a bigger convertible. We liked it so much we deferred that decision. This past weekend forced the issue. Glad to hear that your both OK, relatively speaking. It could have easily been much, much worse. Best wishes on a speedy and complete recovery. Remember, the car can be replaced, your life, and the life of your wife cannot be. Sorry for the pain and suffering you are now experiencing, take things one day at a time, and one step at a time. We will say a prayer for your recovery. Glad to hear you are ok! ****. That’s awful. Sorry to see that sad picture. Your build was one of my favourites. Just a real nice clean street machine with nothing too wild going on (other than a V8 in a Miata. lol). Really sorry to hear about your accident and wish you and the Missus a complete recovery. I guess it could have been worse considering the damage. Thanks for the kind wishes everyone. By way of an update, we are both getting down the path to recovery; a month in the hospital was plenty for me; home is much nicer. Thank goodness for good insurance (other driver had none). My insurance company was very good to work with when it came to the Miata. They agreed to move it to our garage while we sorted out the claim so it wouldn't have to stay outside at a salvage yard. With a neighbor's help we are now in the process of dismantling it for the salvageable parts. Stay tuned for some used Monster Miata drive train parts; there could be an "easy button" for someone doing a Ford swap.